Tomorrow evening the third chapter in Sydney artist Matt Huynh's current body of work will be unveiled at Lamington Drive in Melbourne. His new work "Aurora" (detail pictured above) follows on from last winter's "asperatus" and spring's more colourful "alluvia". His summer instalment takes the form of a mammoth, hand illustrated charcoal scroll running down the length of the entire gallery. The exhibition will give Matt his first opportunity to view the complete work in its entirety. Once installed in the space, he'll experience it just as every guest. The Aurora myth tells of a mortal artist, the lyre playing Tithonus, falling in a deep and impossible love for the goddess of the dawn. To stay together, Aurora begs Zeus to grant Tithonus immortal life, omitting youth. Tithonus ages infinitely, withering and stiffening until he turns into a cricket. 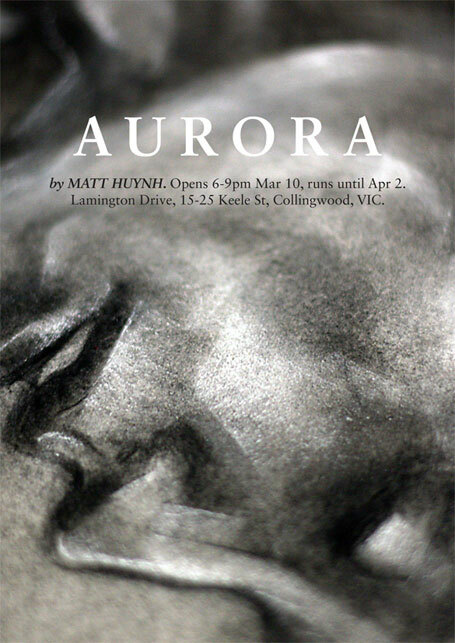 The work draws upon the Aurora myth as harmonious allegory for romance, divinity and the creative or expressive artistic act. Matt explains, "A man bestowed with a miracle or the divine is reassured of his own place and existence with the shadow he casts from the light of something greater, a reflection or impression. Like paint, like line, we are the interference with the sun’s rays, the marks on the page as evidence of ourselves." Owned and operated by the friendly faces of illustration agency The Jacky Winter Group (who represents many of the Australian artists & illustrators we LOVE), Lamington Drive was established in August 2008 as a gallery space dedicated to showing the work of those represented by the agency. The gallery exists to simultaneously explore the awkward idea of having commercial art in a gallery space, and as a venue in which illustrators, cartoonists and designers can explore this same art/commercial art tension in their practices. 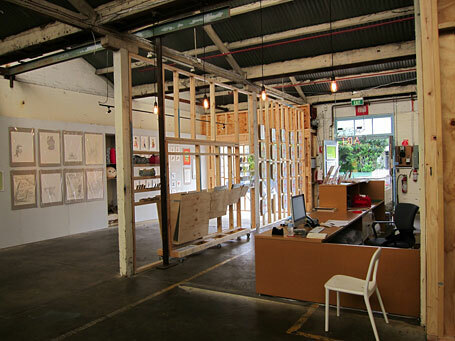 The gallery was recently relocated to The Compound Interest Centre for Applied Art in Collingwood. Designed by architect Martyn Hook of Something Together, in collaboration with Stuart Geddes and Jeremy Wortsman, the space itself was deliberately set up to reflect the tactile and craft-like nature of Applied Art, with all four walls of the gallery lined in single-ply cardboard, which is replaced and recycled each month. Those in Melbourne might also be keen to know about Lamington Drive's in-house fine art printing service. New Blank Document uses the latest Epson ProGraphics Large-Format printers. Pigment prints are designed to have the highest archival potential possible through the use of hand-made 100% cotton, acid-free rag and a UV spray coating. 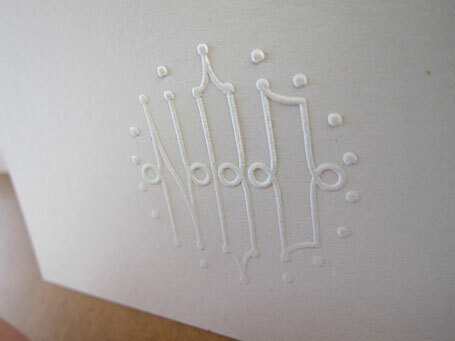 To finish, they are embossed with the New Blank Document ‘chop’ (pictured above). 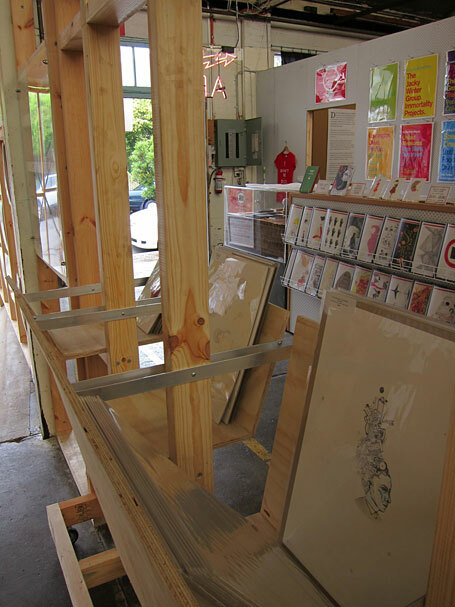 Also being launched at the Compound Interest is next-door-neighbour gallery, Pin-up, an independent project space for architecture and design, established by Fleur Watson and Martin Hook of creative studio Something Together. 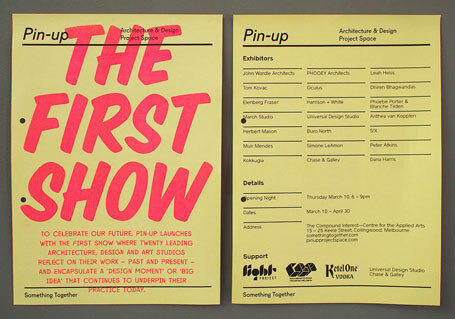 Its first show, called "The First Show", will feature twenty leading architects and designers. Lamington Drive, 15-25 Keele St, Collingwood, Melbourne. Opening Hours: Wed - Fri, 11am-6pm and Sat, 12pm-5pm.